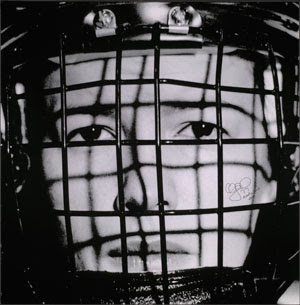 Two Time Olympic Gold Medalist In Women's Hockey, Canada's Cassie Campbell. Canada's caught Olympic fever, and the country's libraries are not immune. Library and Archives Canada has mounted two outdoor exhibits, one in Vancouver and one in Ottawa, featuring portraits of Olympians past. Twenty-three of the finest athletes the land of the maple leaf has produced are the stars of Portraits In The Street and Portraits On Ice. Photographs, drawings, and paintings all combine to showcase medalists and other history-making participants in the Winter games. 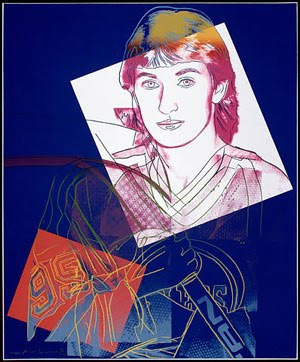 The Great Gretzky Meets The Great Warhol. Gold Medal (Originally Silver Medal) Winning Pairs Skater Jamie Salé. Calgary's Jamie Salé and her pairs-skating partner, David Pelletier, are the only Winter Olympic athletes ever to win a silver medal AND a gold medal in a single event for the same performance. At the 2002 Salt Lake City games, Salé and Pelletier skated a flawless long program to music from the motion picture Love Story. (A prophetic choice of music as the skaters became husband and wife in 2005.) Since their Russian rivals, Berezhnaya and Sikharulidze, had made a minor error on a jump, onlookers were certain the Canadian pair would take home the gold. But when the judges scores were announced, it was the Russian pair who came out on top. To a chorus of boos and jeers, Salé and Pelletier graciously accepted the silver medal, but the controversy remained. The next day an admission, by a French judge that she had given the gold to the Russian pair in exchange for a first-place vote for a pair of French ice dancers, led to a second gold medal being awarded to Salé and Pelletier. A complete overhaul of the scoring system in figure skating was a direct result of this headline-making judging scandal. Speed Skater Charles Gorman, Canadian Olympian in 1924 and 1928. New Brunswick's Charles Gorman never won an Olympic medal, but he's a prime example of overcoming adversity to make the team. 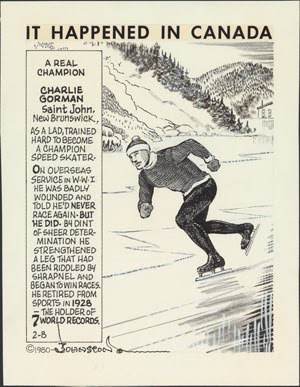 Already a local speed skating champion, he enlisted in the Canadian Army in 1914 at the outbreak of World War I. While serving as a machine gunner at the Battle of Vimy Ridge, Gorman's leg was so severely damaged by shrapnel he was told while hospitalized he would never skate again. Refusing to give up, Gorman proved the doctors wrong, and went on to set seven world speed skating records and participate in two Winter Olympics. He was later enshrined in the Canadian Sports Hall of Fame as "the most colorful skater in history." Canada's Skating Sweetheart, Karen Magnussen, Immortalized by Yousuf Karsh. Figure skater Karen Magnussen was a five-time Canadian National Champion, three-time World Champion, and a Silver Medalist at the 1972 Sapporo Winter Olympic Games. Now a highly successful skating coach in her hometown of North Vancouver, she was at the center of a recent media uproar when it was reported that she, like many other past Canadian Olympians, had not been given tickets to the 2010 Vancouver Games. The oversight was quickly rectified, and Magnussen will no doubt be front and center when this year's competitors in Women's Figure Skating take to the ice. The striking portrait of Karen Magnussen in the Library and Archives Canada exhibit is by one of the country's most celebrated photographers, Armenian transplant Yousuf Karsh. 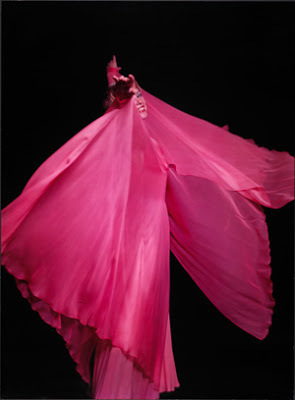 Karsh published fifteen books during his more than half-century long career as a portrait photographer. His celebrity portraits became so iconic that British journalist George Parry once wrote in The Sunday Times, "When the famous start thinking of immortality, they call for Karsh of Ottawa." The Library and Archives Canada exhibit will remain on display in Vancouver and Ottawa through March 22, 2010. The exhibit is also available online for those unable to visit those cities, but looking for a bit of Olympic history to enrich their enjoyment of the 2010 Winter Games. More than one new Canadian champion is certain to be added to this roster of Olympic royalty before the end of the Vancouver competitions.